We Are A Collecting Family! Collecting may not always be genetic, but here at Collectorgene.com it totally is! 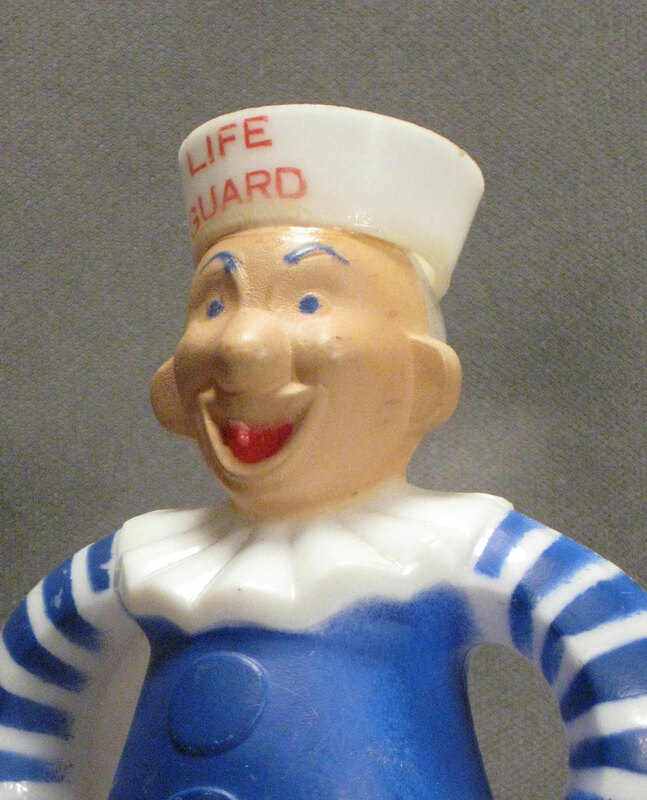 We are a family of four who all love to collect antiques and collectibles. This blog is our way of sharing our collecting journey and the knowledge we have picked up along the way with you. Enjoy! I don’t know why I became a collector. Is it in my genes? Perhaps. Is it the environment I grew up in? This is also possible although neither one of my parents was a collector. Is it my way of achieving some sort of immortality? I’m sure a psychiatrist could have a field day with that one! What I do know is that I have enjoyed collecting for over four and a half decades, and I enjoy it as much today as I ever did. Each trip to a flea market is a new adventure, a treasure hunt that rewards me for my efforts at least in some small way more often than not. People who get their thrills going to sales at the local mall or big box store have no idea what they are missing. Hunting down little bits and pieces of history never ceases to draw me in. In other words, finding old stuff never gets old! Other people may not wish to emulate our family lifestyle, but they can’t say our house isn’t at least “interesting”. There are a couple of things that have helped me on my collecting odyssey immensely, and they have more to do with attitude than anything else. First, I have always collected what I like. My primary interest in purchasing an object is always the “cool” factor – not the investment potential. Second, I have an abiding interest in history. You don’t have to be a historian or scholar to enjoy collecting, and I am certainly neither one. It does help, however, if you have a general knowledge of the events, styles, famous people, etc. of each decade. It helps put objects in perspective and makes them more interesting. It also enriches your life. I have also found that no matter how much the years of experience may have taught me, there is still so much I don’t know. I can still go on one of my hunting and gathering adventures and see something I have never seen before. Fortunately, with the internet, research is now easier than ever. You can even do it from your phone! Remember that in the collecting world, acquiring knowledge is as important than acquiring stuff! Speaking of stuff, you may be wondering what kind of stuff I collect. Primarily I collect among four principle categories. They are old advertising items, presidential campaign memorabilia, old toys, and perhaps the most important category of all – anything else! We are not rich people walking around with unlimited budgets. I can’t simply buy whatever I want whenever I want. The object of this game is to buy the best you can within the budget you have. For this reason, I took the blinders off years ago. I know collectors who look for very specific things and there is nothing wrong with that. I find, however, that opening your options up to whatever the flea market or antique show has to offer is more fun. Everyone has an opinion and much has been written about the state of the antique and collectible world and where it is going. I’ve heard a lot of doom and gloom about the hobby over the years, but I also see signs of life out there. Personally, I think the internet has had more to do with reinterpreting the value of things than the economy. We simply have more knowledge about availability and rarity of objects than ever before. There has certainly been a “correction” in the marketplace but if you’re a collector, this also presents opportunity. The cool stuff is just a little more affordable. There is presently no shortage of TV programs dealing with antiques and collectibles these days. Some of this may be due to recession ethics and the thought of making a quick buck off your old stuff. I think, though, that it has more to do with the fascination that these survivors of our cultural past have on us. Whether we like it or not, we are all the connected to the past, both our own and that of our ancestors and the world that we and they have shared. We cannot go back in a time machine, but we can touch the past through the objects left behind. Are we born with a collector gene, a predisposition to acquire and accumulate “stuff?” Maybe so. At first glance, it wouldn’t seem as if I was destined to take great pleasure in the hunt for the rare and the funky. Yet, on deeper examination, maybe I was. I doubt that my collector gene comes from my mother. She had very few material possessions and was the most frugal person I ever knew. Knick-knacks were verboten in my home; they collected dust. Yet my mother did hold on to sentimental items belonging to family members. She did save many of my childhood toys. Somehow, she even knew to keep my Barbie and Ken and my Shirley Temple doll with their original boxes. More likely, though, any collector genes I have come from my father. As a young man, he and his brother collected stamps. The same uncle also collected toy trains. My father had an interest in coins, too, and tried to pass that interest on to me. I remember diligently sifting through his loose change looking for wheat pennies to press into my blue penny album. Somehow, though, I never really got into coin collecting. It wasn’t that exciting. The first real collection that I acquired all on my own was my gumball machine charm collection. In the late 1950’s and early 1960’s, I would accompany my parents to the supermarket and anxiously await the moment when we reached the checkout line. It seemed as if I always had at least ten pennies, maybe more, to put into the machines that were lined up along the front window of the store. Of course, half of the time, only a colorful gumball rolled down the chute and into my hand. However, I would always go home with a few plastic charms to add to my collection. I particularly remember liking my tiny Buddha, a little mailbox, and a miniscule “pack” of Pall Mall cigarettes. I would take them home and save them in an old coffee can. Not surprisingly, I still have the can and its contents. Looking back, I didn’t have as many collections as some kids do. I did like my numerous Little Golden Books and my Nancy Drew’s. I had enough different dolls to call it a “collection” of sorts. I certainly liked acquiring Barbie outfits. However, nothing about the first sixteen years of my life would have hinted at what was to come. I started dating Jim in my junior year of high school. One of the things I found intriguing about him was that he was very interested in history and was already acquiring old military items – helmets, bayonets, cartridge boxes, etc. How many eighteen-year old guys do something like that? And it wasn’t as though his parents were collectors. Far from it! This was just something he was doing on his own. About a year and a half after we started going together, we went to a little flea market about two miles from home. Jim bought a Dewey button and an “I Like Ike” button, and his political collection took off. Several weeks later, we ventured to New Hope, PA. In an antique store, I purchased an early 1900’s magazine for $1, and my love affair with ephemera was born. I guess I should add that none of these early purchases is worth a whole lot more than what we originally paid, but what does that matter? We both discovered that hunting for old stuff is great fun. Those early forays into antiquing took place in 1970. We now estimate that we have done some form of antiquing about fifty weeks of the year every year since then. Are we addicted? Absolutely. Is there any end in sight? Absolutely not! Collecting is fun. Collecting is challenging. Collecting is educational. And, yes, collecting is often lucrative – when we sell something for many times what we paid for it. Of course, we have to be willing to part with the object for that to happen, and collectors sometimes find that hard to do. Jim and I, fortunately, share similar tastes in collecting. We both like toys and advertising and the strange and unique. We like things that are graphically interesting. I’m always drawn to paper items – books, magazines, postcards, trade cards, catalogs, calendars, etc. I’m also quite partial to old holiday decorations. I tend to be the cheapskate in the family, but not always. Sometimes something “speaks” to me, and I have to have it. Every collector understands that feeling. We’ll be setting out next weekend, as we have countless times before, to see what treasures we can bring home. Amazingly, we’ve passed this obsession on to our kids, too. 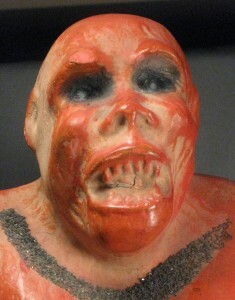 Many fellow collectors and dealers tell us that their kids hate antiques, but not ours. Nature or nurture? Does it matter? Only someone who has experienced the thrill of the hunt can understand why we like being collectors. Just like the little girl who couldn’t wait to see which charm was going to come down the chute of the gumball machine, this grownup girl can’t wait to see what treasure she’s going to find on the flea market table or in a box at a yard sale. When your parents take you to your first flea market when you’re a month old, I think your destiny is pretty much set at that point. That’s what happened to me. Here I am, 28 years later, and I still can’t think of any better way to spend a sunny weekend. The thrill of the unknown, the excitement of the discovery, the fact that I can spend $5 and leave completely satisfied, those are huge driving forces that compel me to keep hunting week after week and year after year. Like the rest of my family, I really can’t be defined by one specific collection. As is the case with many people around my age, I remember my childhood in the 1980s and 1990s quite fondly, and these memories play a large part in guiding me towards the items I collect. Many of these items are action figures. I grew up in an era when colorful pieces of molded plastic with creative, original back stories were commonplace, when the good guys always won (but the bad guys were at the very least interesting), and when so many toy companies were fighting for my hard-earned allowance money that it was truly an overwhelming experience having to settle on just one toy at a time. Collecting Star Wars action figures – the original ones, which have been referred to as “vintage” as early as the 1990s – was my first foray into looking at toys as something to collect and not necessarily something to play with. After rummaging around at many different yard sales and flea markets in my youth, it became clear that certain figures were harder to find, and when I finally found them, they seemed more at home on a shelf where I could admire them from afar than in my grubby kid hands being thrown around my bedroom. This is not a leap in logic that should be taken by any 6-year-old, but perhaps that’s what has separated me as a collector. While I went through a period ranging from sixth grade through the end of graduate school where I hunted for brand new Star Wars action figures in stores, over time, I realized I had more fun learning about and hunting for the wide range of toys and fun items from my youth. In an era where everything is meticulously documented through websites, I felt that a bygone era prior to the internet left plenty to be discovered. Action figures are certainly fun, but I’ve expanded my focus immensely over time. Old video games, old board games, old cereal boxes and lunch boxes, animation cels from the cartoons that aired when I got home from school…if I ever get discouraged at not being able to find what I want in one category, there’s always something else up for grabs right around the corner. 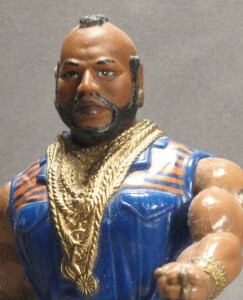 One collection that has given me immense satisfaction has been my Mr. T collection. 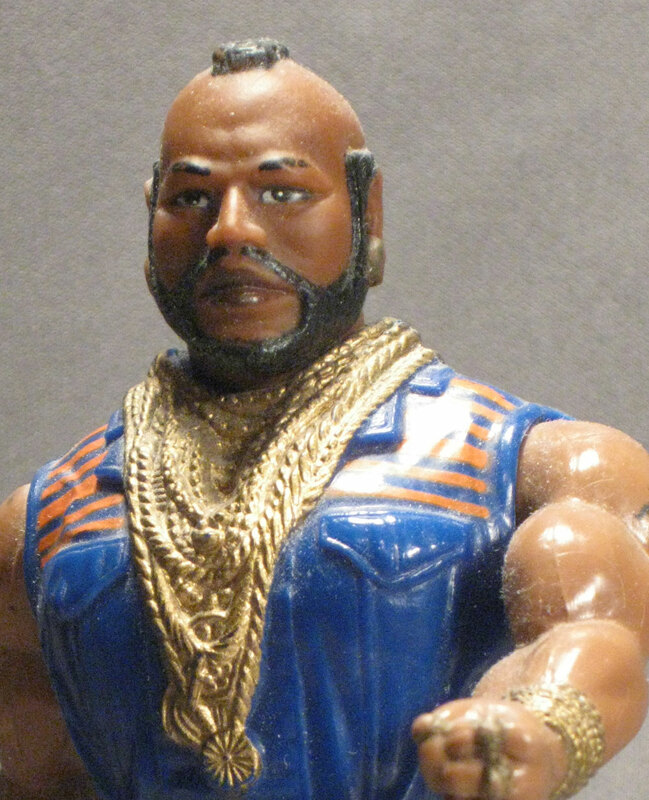 When I started buying items that featured Mr. T’s face on them in high school, little did I know exactly what I’d be getting myself into years later, as there are literally thousands of items featuring his likeness that have been manufactured all around the world. I may take collecting very seriously, but I wouldn’t continue to pursue this hobby if it wasn’t a lot of fun. Obviously, as evidenced by this website, it’s an activity that’s kept my entire family close, but it’s also something that’s generated a number of important friendships in my life over the years. Collecting can come with its fair share of frustrations when it comes to dealing with others who share your passion, but I look at this as a hobby that can bring people with these shared interests together in a way that wouldn’t have been possible otherwise. Being the youngest in a family of collectors means that I have been nurturing this addiction since my parents brought me home from the hospital. I have been visiting flea markets, yard sales, and antique shops since I was an infant. When exactly I became conscious that I was destined to collect things like my parents and brother before me, I do not know, but I do know that I wouldn’t have it any other way. A lot of people are surprised when they find out that my brother and I enjoy collecting as much as our parents. They are flabbergasted by the fact that we like antiques even after growing up in a house full of them. For me, I think it was the excitement of the hunt that got me hooked on collecting. My parents started a collection of “Three Bears” books and memorabilia for me when I was little, and it was always exciting to rummage through old books looking for a variation on the story. I also learned how exciting it can be to find a bargain when rummaging through old stuff, and that lesson further reeled me into collecting. My tastes have changed throughout the years, but my passion for collecting has never wavered for as long as I can remember. I have always found it difficult to focus on one collection. I have gone through several stages of collecting specific action figure lines with my brother, and I even went through my Beanie Baby stage when I was a kid. Truth be told though, I would always see other objects that fascinated me but didn’t fit in any of my collections when I would go out looking for collectibles, so I decided in adulthood to not focus anymore and just buy things because I like them. Of course there are certain things I gravitate to regularly. Let’s face it; when you find one object that interests you, you want to find more objects like it. Rather than having one big specific collection, I just have a bunch of smaller ones. I have a definite passion for Disneyana, though I tend to focus on specific sub-genres of Disney since so much merchandise exists. I also love toys. Oddball obscure toys tend to be my focus at the moment, but I have dabbled in a little bit of everything. Miniatures fascinate me and I have sizable collections of Cracker Jacks and gumball charms from the teens- ’60’s as well as little rubber figures from the ’70’s-’90’s. 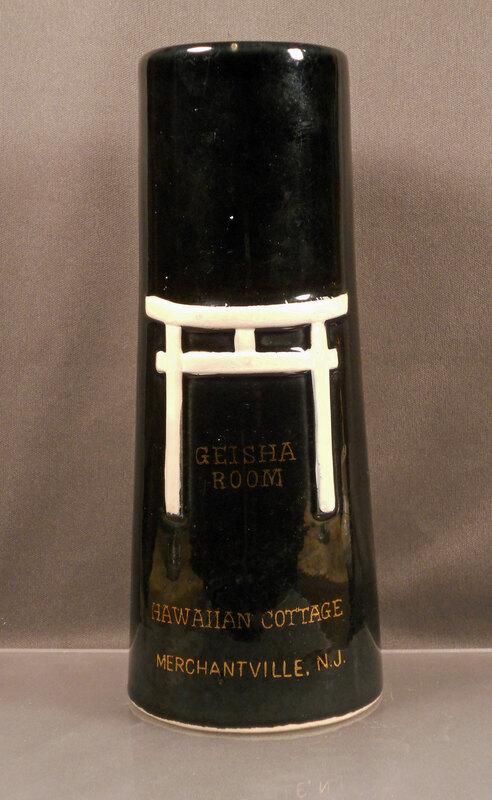 I also love the 1950’s and ’60’s decor, and especially gravitate towards mid-century modern decor and Polynesian decor from that era. Art has always been a passion of mine, though I can’t afford much of it at the moment. Occasionally I sneak something cool into my collection. Urban Vinyl, or modern art toys, are one of my favorite ways to affordably add art into my collection. I also like to collect things that I can use on a daily basis, or as a form of entertainment. Therefore, I also hunt for obscure VHS tapes, vintage board games, video games, and vintage t-shirts that I wear on a regular basis. Since graduating college, my collecting has led me to a career. I have my own business restoring antique pottery, plaster, porcelain, etc. I am also creating and selling my own line of miniature figures reminiscent of the little figures I grew up with as a kid. It is great to tie my love of collecting and art into my businesses, and it is very satisfying work for me. The longer I collect, the more I appreciate an object that I have never seen before. I think one of the most satisfying aspects of collecting, to me, is when I find an object that I know nothing about, and then through research find out that there is far more to its story than I ever could have imagined. I hope to share some of the stories I have found along the way through this blog, and I hope you find some of the objects in my collection half as interesting as I do. 14 Responses to Meet The Family! Great website! anyone for Brimfield this year? Very well done guys. I’ll be making this a “favorites”. We collect shoe shine boxes also. Do you ever sell or trade? On our site there is a collection shown under the exhibition “Shine”. Pls contact. Have never met another shine box collector! This is great to know there are others out there. Thanks for contacting us at the Collectorgene. My apologies for not getting back to you sooner, I should check our “Meet the Family” page more often. I took the opportunity to view your collection and all I can say is wow! Your collection is spectacular. I also loved the fact that you knew the history of some of the boxes. You obviously have a passion for what you collect and it shows. I think shoe shine boxes are wonderful examples of Americana and I don’t understand why they seem to be underappreciated in the collecting world. The good news is that there are more pickings for guys like you and me. I have occasionally sold a box but I don’t know of any that I have for sale at this time. I will keep you in mind though. Thanks again for contacting us and please keep in touch. Hi Jim, Carol, Amy, and Ben- This post is probably mostly for Jim but non the less- I stumbled upon this blog a month or so ago while doing some research. Jim’s “Carry on Roosevelt” button caught my attention. I collect and sell political campaign items and specialize in FDR. That pin of yours is really great I’ve long coveted one! I wanted to make you aware of my site at http://www.mussellamericana.com This week we’re putting up our first sales list. I’l have around 75 political campaign items. Please stop by and check out the preview of items that is up now. Official list will be up Thursday at some point and check back or subscribe to get updates on more great lists to come! 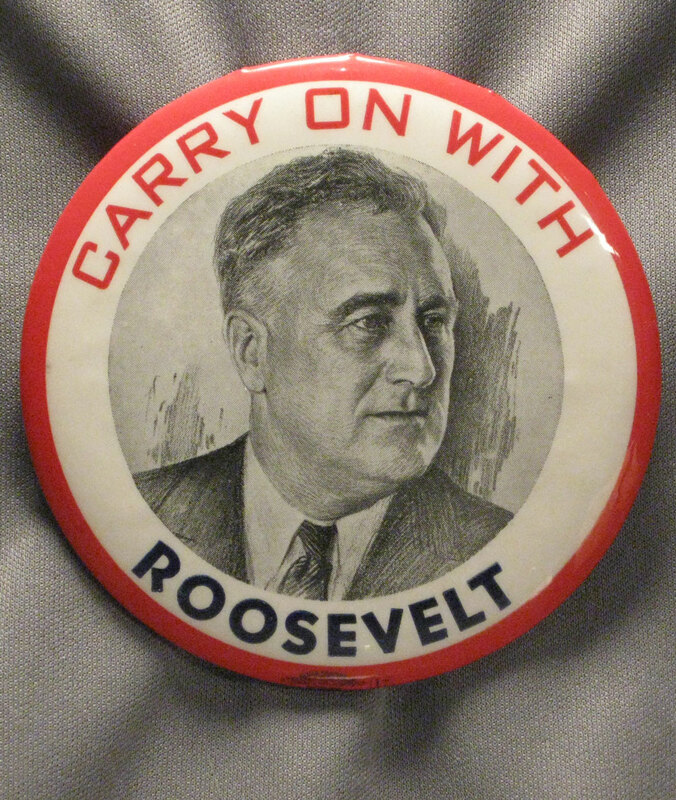 As a side note- I’m sure you’re attached to your “Carry on Roosevelt” pin but if you’d ever like to part with it I’d give you a good deal of credit on some of my list items or be willing to buy it outright. Either way keep up your good work on this blog! I’ll keep checking back to see what all of you find out there! I knew that my Roosevelt button would catch somebody’s attention one of these days. I think only an FDR collector would realize how rare that button is. I almost hate to tell you how I got it. A friend of mine, who is an antique dealer, knew I collected political items and told me that the owner of the shop he had a booth in had a group of political buttons that he was trying to get fifty dollars for. My friend thought that with his connections he could probably get the group for thirty dollars. He said he thought that there were some early buttons in the lot so I told him to buy them even though I didn’t know exactly what I was getting. When I finally got the buttons, there was the “Carry On With Roosevelt” along with some nice but common Hardings and a few other pieces. This was only a couple of years ago. I haven’t had the heart yet to tell my friend exactly how big a favor he did for me! Good luck on your new website. I checked it out and enjoyed reading both of your backgrounds. Like your father, I was a history major in college and was in my senior year when the 1972 election took place. By that time I had been collecting political memorabilia for a couple of years and made a point of going to Democratic headquarters in Philadelphia that year to see what I could buy. They were pretty picked over by that point but I managed to buy a “President McGovern 72″ T shirt which I still have. My career path,however, took a turn and I ended up in the family insurance business until I retired a couple of years ago. My love of history never left me though. As you correctly surmised, I am attached to my Roosevelt button and I’m not really interested in selling it at this time. I will keep you in mind though if I have a change of heart or possibly see something on your website that I covet more as I know it would go to a good home. Again, good luck with your website and please keep in touch. I love those kind of button stories- the only way I could like it any better is if I was telling it to you! 😉 Keep on picking and I’ll check back in from time to time! My first sales list will go up 6pm central time tomorrow so make sure and stop by http://www.mussellamericana.com around then. I’m a creator of 3D computer models, my current project is the classic age of the silver screen. Doing my research I found your page, (http://collectorgene.com/?p=741) , it was exactly what I was looking for. In fact with the provenance you relate it could not be any better. It is my intention to distribute this model as part of my “Silver Screen” package. To do this I would need your permission to use your photographs as the basis for the model’s textures. It would be very easy for me to create a generic clapperboard texture in Photoshop but somehow I feel that by using yours and making reference to where it came from would in some small way allow the spirit of that golden age to live on. As long as you credit us, go right ahead! I have this item but it is the newer version that has Cherry Hill printed on the reverse. That dates it to 1961 or newer. Do you know its worth? I would put a value of no more than $15.00 on it. As you can imagine, they show up fairly regularly in the South Jersey area. It’s a cool piece of local history.